The Vélib system in Paris and now London’s bike-share program get lots of attention, but all sorts of European cities have similar programs. The German newsweekly Der Spiegel says the number has hit 100. Does it get more people on bikes and reduce congestion? Nearly half of Vélib users say they drive less due to getting on a Vélib more. 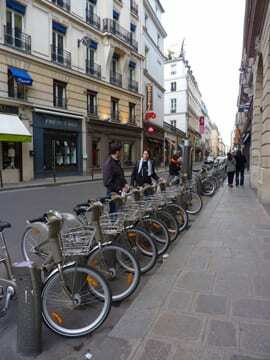 It’s easy for tourists to use too, with bikes and racks seemingly everywhere you look. There aren’t many such systems in the U.S., although Washington D.C. recently expanded and relaunched its program. 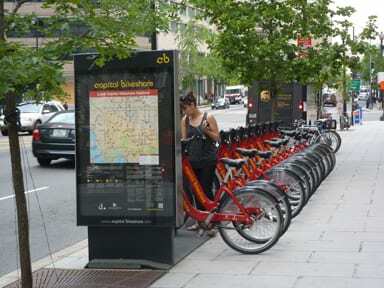 Tags: bike sharing, London, Paris, travel, Velib, Washington D.C.
Our nation’s capital joins Paris, London and Montreal, among others, with bike-sharing programs. 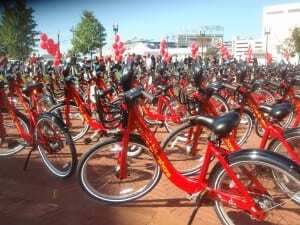 Dubbed Capital Bikeshare, the program has more than 1,100 bikes available at more than 110 stations in DC and Arlington. A 24-hour membership costs $5 (you can also buy 30-day and one-year memberships) and you can get a bike as often as you’d like. Like elsewhere, the first 30 minutes of each ride is free. It’s a great way to see the sights or explore a new neighborhood, use the city’s extensive trails or get to the ballpark. Just don’t forget to bring your helmet! We hope to see government officials using the distinctive red bikes to get around and learn the joys of cycling!